On this evening we will be donating to:The Molecular Scanner Appeal Derriford Plymouth Hospital, Fynn's First Footsteps, Plymouth Food bank & The SHADO Centre. 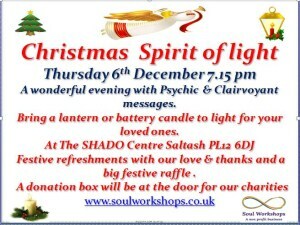 A free wonderful evening of entertainment that we hold every year, we fill the hall inside and out with candles, lanterns & lights to celebrate with our loved ones in spirit that have passed.With Clairvoyant & Psychic messages from all of our Mediums. Festive refreshments our love and thanks for your support for our Charity work, with a big festive raffle, donations taken at the door for our charities.